This is the application used to launch different processes to dump control board data to files (positions, velocities, accelerations, voltages, currents, tracking errors). Place here default configuration files and scripts. Build online map to link the robot stereo vision to its kinematics structure. A collection of yarpscope instances used to display fingertips skin values. This application allows performing nice preprogrammed demonstrations with the robot. This is a basic visualization for the skin and in particular for the left and right hand which include the fingertips and the palms. The app directory stores directories which group sets of configuration files and scripts to run a certain group of modules together. Each one of them is what we call an application. In other words, an application is an instantiation of a set of modules that run at the same time. 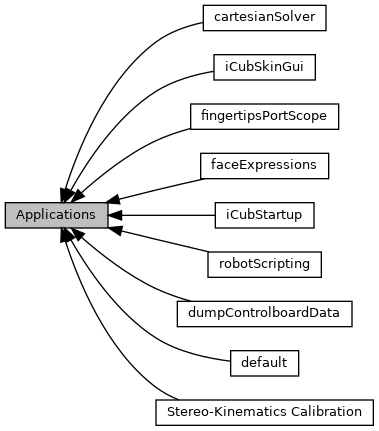 Some of these applications are iCub capabilities, others might just be nice demos or experiments. Documentation for each application goes in each directory. Ideally these directories will contain only scripts and ini/txt files. Use src to store source code.